Mmm. 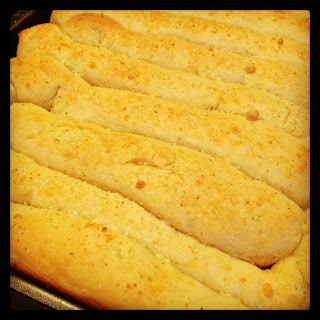 These breadsticks are seriously delicious. My sis, Lindsay, made these and shared it on FB so I decided to try them. They aren’t crazy healthy but they aren’t restaurant grease ball messes. When you make food that tastes so good like this (without the stomach ache) and still use healthy ingredients, you just don’t care to eat out. 1 TBSP yeast in dissolved in 1 1/2 cups warm water with 3 TBSP sugar. Let sit 3-5 minutes until bubbly. Add 1/2 tsp salt and 3 1/4 cups flour. Mix together and knead for 3 minutes (I do it by hand). Let dough rest 10 minutes on counter. Melt a stick of butter in a bowl. 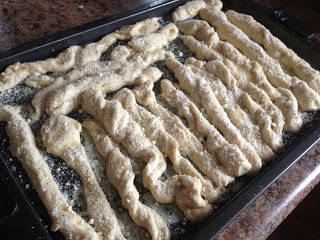 Roll out dough and cut into strips. 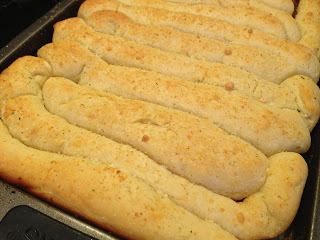 One strip at a time, dip into butter and place on a cookie sheet that is rimmed. After every strip is on cookie sheet, drizzle butter all over if you’d like (like I said, not super healthy). 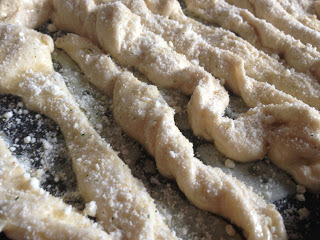 Sprinkle as much parmesan cheese and garlic salt with parsley on top of each strip. Cook 15-20 minutes at 375 degrees. Eat with homemade pizza, soup, or whatever you desire and enjoy every bite. Seriously. These look awesome! Will have to try! I've noticed since I've been cooking more and making more from scratch that I often am disappointed when I go out! The meals just aren't as good as I used to think they were. Not in every case! But definitely more often than I would have thought. I just read through your instructions and wanted to mention that I melt the butter directly on the cookie sheet in the oven then coat one side of the breadstick, then lay it right in the butter on the other side. Easy to evenly coat all of them!